For me personally, being a Christian in light of historical criticism and other scholarly approaches means accepting a high degree of Christian agnosticism. There are things that we simply cannot know, and so we must learn to embrace doubt, not necessarily as an end, but at the very least as a means to exploring our faith and living it. It is crucial to move away from dogmatic certainty to humble service. Christianity has long held that its faith is different, in that its savior character was and is an actor in human history. Its heroes and gods did not exist in some distant, fairy-tale past. No, they are tangible, present, real, “with us.” The crisis of faith for a Christian is especially traumatic, not only because it changes our view of the invisible supernatural world, but because it changes everything — how we think we know about the past, the present, and the future. It changes how we view ourselves in relationship to the world. Are we the apple of God’s eye, or just a tiny speck on a rock that’s hurtling through space? When I was finally honest with myself and looked at the universe the way it really is, the idea of “exploring our faith” was the last thing on my mind. My faith lay motionless, blown apart like the corpse of great Tiamat. I didn’t want to investigate that corpse; I wanted to create a new world. McGrath continues with some unsupportable conclusions. First, if you didn’t already know, “minimal definition” is a specific conceptual term. It refers to the shortest, most concise description of a word to which the majority of speakers of a given language within a specific domain would agree. But note the inherent problems with this strategy. It’s one thing to ask what “democracy” means within the framework of political discourse. It’s a far different thing to ask what the minimal definition of “faith” is within the domain of the English language. I just took out my trusty old Compact OED to see how many main-heading definitions the word “faith” has. If you’re interested in how many I found, it’s 14. Within the broad spectrum of the word “faith,” I suppose one common theme comes through (at least in the OED), and that’s the matter of trust. That is to say, when we trust an individual or a system of beliefs we say we have “faith” in it. On the other hand, within the theological realm there is some very specific baggage that comes with “faith.” We’re often talking about articles of faith — viz., the minimum number of things you must believe. It isn’t about assenting to a proposition; it’s about reciting a credo. When I say I believe in evolution, I don’t have faith in it. Science doesn’t require faith. If I were more careful with my language I would say, “I assent to the proposition of evolution.” And if evidence came along that disproved it, I would withhold my assent. Religious faith does not work that way. In the religious realm faith often requires “belief in the authenticity of divine revelation.” It is the blind, unquestioning acceptance of divine truth, not the conditional assent to a logical proposition. Rauser’s minimal definition fails not only because the scope is undefined and far too broad, but because it is a distinction without a difference. All propositions are conceivably false. He isn’t telling us anything we didn’t already know. It is therefore utterly useless. The question is whether we hold to those beliefs (which could be false) because of evidence and logic or because we are convinced they are required for salvation. A distinctive feature of religious faith is the way we cling to beliefs despite all evidence to the contrary. If I “have faith” in my friend Frank to come pick me up at 5:00 PM, but he never shows up, my faith is shaken. I’m disappointed in Frank. On the other hand, if I “have faith” in God to answer prayer, but my wishes don’t come true, then surely “God works in mysterious ways.” My faith is not shaken. So clearly we’re talking about different kinds of faith and belief. Believing in the Son of God is different from believing that it will rain tomorrow. One is a postulate that we cannot and will not deny. The other is a forecast based on probability. In short, atheists, rational materialists, freethinkers (whatever label you prefer) do not have the kind of faith McGrath is talking about. He is projecting his worldview on others. This is the trap of “walking a mile in another man’s shoes.” Empathy is about seeing things from another person’s perspective, not imagining yourself in somebody else’s situation. The former is the first step to understanding others; the latter is a kind of naive narcissism that does more harm than good. * A famous quote from Hall-of-Fame bowler, Billy Welu. Posted on 2012-03-17 01:33:42 GMT+0000 by Tim Widowfield. This entry was posted in Exchanges with McGrath and tagged Biblical Scholarship, James McGrath. Bookmark the permalink. This is about faith and beliefs concerning Jesus or God. Alfred Loisy, being a former Catholic who fought with the Vatican, and got excommunicated, saw the problem of faith in connection not with God, but with the Church. He is famous for his quip: “Jesus was announcing the Kingdom, it’s the Church that came.” He also defended the case of historicity against Couchoud’s mythicism. “The ancient believer is before everything else a man who goes to confession, goes frequently, and even the more often that he does not indulge in the actions considered sins by Catholic morality. He’s a man who practices intellectual obedience, agreeing in principle to all the teaching of the Church, and accepting without examination every article he’s been taught; not discussing the meaning or the scope of his belief; thinking of himself within the Church as a disciple who learns from it all he must think about all the great subjects of life, what he has to do to be a good man, what he must practice to be a Christian. This is a man whose all activity is regulated by an external authority, and who is not interested in thinking for himself, who would consider himself guilty of such temerity, who looks upon intellectual shyness as a virtue. He forbids himself to think of religious questions, for fear of thinking wrong; he takes his religious instruction from the good books recommended by his director, and he has no other thoughts than those that are guaranteed very orthodox and very safe. This model of Catholic exists, it cannot be denied. He is not frequent, at least those who embody it to perfection are not very many, whatever has been done to multiply their number. For this model can be realized only at the cost of an abdication of nature, which many instinctively resist, and others consciously reject as a violation of their personality.” (Things of the Past, 1912). “Modern unreality” as you say up front, this creation and what we perceive it to be, is the antithesis of THE UNSEEN, which is the essence of reality in mysticism/gnosticism. “modern reality”. Didn’t catch it before posting. Empathy is about seeing things from another person’s perspective, not imagining yourself in somebody else’s situation. The former is the first step to understanding others; the latter is a kind of naive narcissism that does more harm than good. Natalie Reed has a great column on “Hipster Mysogeny” at Freethought Blogs. Very apropos your empathy quote. Empathy is certainly not the capacity to “see things from another’s perspective”, it is to share the emotions felt or shown by another person. Empathy is a a new feeling resulting from a contagion of feelings. 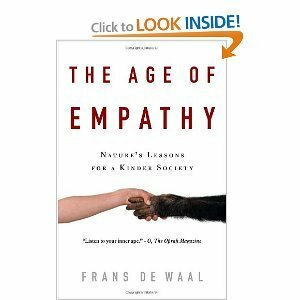 Frans de Waal has lengthily studied primates, who can feel empathy. Assessing reasons and “identifying with the other” is an elaboration by the frontal lobes of feelings already experienced in other circuits of the brain where the contagion of feeling takes place. That is empathy in the human brain is amplified by the thinking circuits, but its basis is not intellectual, it remains emotional. By “see” I meant the broadly “to understand.” It is important, as you say, to try to feel what others feel. When you hear somebody say, “Well, I don’t understand why she should be offended by that!” — it means they are imagining themselves in that situation. They aren’t trying to feel what it’s like to be the other person. It’s the same thing when you hear people wonder aloud why people don’t “pick themselves up by their bootstraps.” Well, that’s because they aren’t you. Roo, certainly one can interpret “see” narrowly, but Tim and I both took the meaning much more broadly, much in the sense you do, I think. Thanks, Dave, for the great link. Tim, in empathy, there’s no trying to feel. The contagion of emotion, like from a baby to her mother, is spontaneous and doesn’t involve any conscious effort, and even less any willed intention. You’re thinking too much of imperatives, as in “you should feel,” or “try to feel,”. But that is not empathy, that is a moral imperative issued because of lack of natural, spontaneous emotional contagion. This is what bugs me about phony Christianity, the feelings are not natural, real, they are dictated as precepts of morality. “Love your neighbor as thyself”? That is the antithesis of empathy. Empathy follows brain pathways that do not go through the frontal lobes. Yes, there is disagreement about whether empathy is strictly emotional (hence, innate and spontaneous) or both cognitive and emotional. In fact some researchers are now using the term Perspective Taking (warning: PDF! ), as either a distinct component of a broader definition of empathy or to distinguish empathy from the willful act of trying to think and feel like another person. 1. Some people are incapable of empathy. In the Time article you referred to, de Waal called these people psychopaths. However, more often than not they are not psychopaths, but sociopaths. Sometimes they’re quite capable of detecting emotions in others, but they lack the ability to identify with them. They may even take pleasure in others’ misfortune. 2. Just because you can empathize with another’s emotions doesn’t mean you will view them as valid. Instead of a shoulder to cry on our a helping hand, some people say, “Snap out of it!” This, I think, is evidence they they are imagining themselves in another’s situation, not viewing the matter from the other’s perspective. 3. Our society often teaches people to deny our own emotions as a sign of strength and to look down on others who do not react the way we think they should. For these reasons and others, a mixture of cultivated innate empathy and conscious “perspective taking” is required before we truly understand other people. Beyond that, it’s important to accept the validity of others’ feelings and their reasons for feeling that way. Some Christian (and Jewish and Moslem) believers are necessarily faced with a faith-conflict here. The Bible tells them how to think and feel about nonbelievers. Jesus and other prophets lead by example and precept when they insult and condemn outsiders as being hypocrites, fools, etc. I imagine those who lack genuine empathy are not bothered by contradictory inputs and can with the greater conviction embrace the Book’s judgements of the outsider.